Liberty Lighting Trucks are priced two ways; "Complete" and "Grip Only". The "Complete" truck has the entire tungsten package included (see individual truck list). 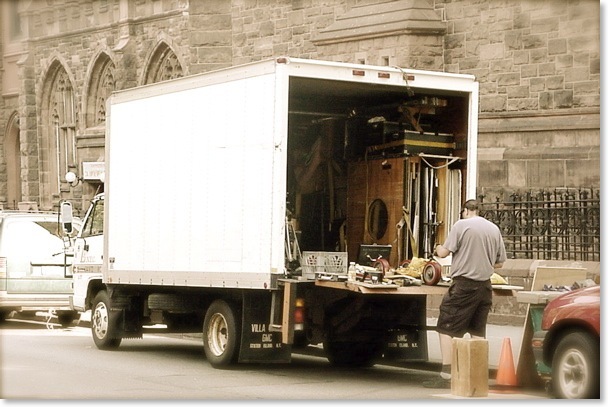 "Grip Only" is the truck without the tungsten lighting for days when only HMI's or Kinoflo’s are required. However, we do not remove the tungsten package from our trucks, so should your equipment needs suddenly change, the tungsten lights remain at the ready. Liberty can custom tailor a Truck Package to your specifications and we are always happy to provide you with a competitive quote. Since we drive our own vehicles to location there is no need to hire a separate Grip Truck Driver which can often amount to a significant savings. Our Gaffers are available with or without our Lighting Trucks. If you require crew, we know the local talent well as we've worked with just about everybody over the years. We will gladly arrange a lighting crew suitable to your project and budget requirements. Prices do not include tax, labor, gas, tolls, or expendables (pay-as-used). Please note these are not "List Prices" but our everyday discounted "street" prices. For longer jobs, please contact us about additional discounts. Labor rates vary by project, but our typical Gaffer rates are $600/10, plus standard Overtime rates. Standard Overtime is 1.5x (time and one half) for hours 10-12, and 2x (double time) after 12 hours. Our Gaffers drive our Grip Trucks so there is no need to pay someone just to sit with the truck all day. Since we drive our Grip Trucks, our rates are portal-to-portal, which includes the actual drive time to/from location from our shop in Brooklyn, NY 11215. For additional information on Liberty Lighting Policies, see the fine print. We provide expendables on a pay-as-used basis. We do not force you to buy a whole roll or even a quarter roll. Gell and diffusion are priced by the yard, blackwrap by the foot, etc. You are always free to provide some or all of own expendables. If you require more than a partial roll, please be sure to let us know in advance. Click here for compete on-board Truck Expendables List.